After years of agitating for this sort of thing, U.S. Army troops have finally convinced the brass to create a realistic wargame where each game character (or "avatar") would not just represent the soldier playing the game, but would portray that players' actual physical characteristics (speed, strength, accuracy with weapons and so on) and appearance (shape and face). This is genius. Take advantage of the fact that young men will play first-person shooter games for all hours by providing access to realistic games that reflect your personal characteristics. And allow the troops to update their avatar's characteristics based on their PT scores and education credits. You train the way you fight because you'll fight the way you train. We can add that our troops should play the way they are able to fight because they'll fight as good as they played. So lately I've been getting phone messages from someone who tells me that they have business with me concerning my student loans. I should call them at 1-800-635-3743. My question is, why should I do business with a company that just lies to me right off the bat? How do I know that I don't have business with this company regarding my student loans? Simple, I paid off my student loans some time in the twentieth century. So the alternative to this company being a bunch of deceptive liars is that they are grossly incompetent. Yeah, I want to deal with them. I find these people even below the duct cleaning people who call because they happen to be in my neighborhood at that moment--and less believable than the Nigerians emailing me to let me know I am their only hope of getting millions of dollars unfrozen. So are the Iraqis, after demonstrating that we will pull out our troops when told to do so, agree to a return of some American troops? "One of the things we're looking forward to doing is sitting down with the Iraqis in the coming month or two to start thinking about how they want to work with" the U.S. military to develop a program of exercises, training and other forms of security cooperation, Flournoy said. It will be easiest to get our trainers back in, since Iraq needs our help to prepare their armed forces for conventional combat to deter invasion. So Iraqis except for the most slavish pro-Iranian stooges--could accept that we'd enhance Iraqi "sovereignty" by our presence. Once in for that purpose, it might be easier for the Iraqis to ask for conventional American capabilities to fill in the gaps until the Iraqis can fulfill those missions on their own. And with troops in Iraq, we can again provide the insurance for political factions that they can pursue their goals through political processes and not resort to violence. Kudos to the Obama administration for not giving up on this issue. I'm disappointed that they didn't seem to care about staying in Iraq after 2011, but if they at least see that it was a mistake to leave, I'll cut them some slack as they try to return to Iraq. Iraq recently complained to Iran and Turkey about not respecting Iraq's sovereignty. ... Iraqis were upset about a casual remark by the Iranian head of the Quds (overseas terrorism and political manipulation) Force, who asserted that Iranian backed militias controlled southern Lebanon (Hezbollah) and southern Iraq (several much smaller militias that once had considerable control). The Iranian government quickly apologized for the Quds commander's remark. Iraq lives in a rough neighborhood. The arguments for our return are clearly available. This last weekend gave us too little snow on the small hill near me for sledding. And two weekends ago, we also missed out when the snow went right to a gaseous state. Lamb tried to sled on the tiny slopes by the road but that just didn't really satisfy. But Lamb was game to try! But a week ago was perfect. Just enough snow to cover the hill and it was powdery. So off we went! I knew she was really having a ball when she flung her hat off one trip down the hill. Perhaps the first time I took her sledding, her hat came off and she embraced the idea of going so fast that the wind just rips the hat from her head! She knows I don't believe it. She knows that I know that she doesn't believe it. But the hat still goes flying off at some point. She even knows that the hill isn't anywhere near as tall as she once thought it was. This is the last year I can get away with taking her to this one. But when Mister got too big for the hill, we had only one year at the really big hill (which I thought I was going to die on, as I spun around on the saucer racing down) before he lost interest in sledding altogether. But I'll gamely go on as long as she wants to. And now our tradition is to have hot chocolate with marshmallows after. Tradition is good. The mindless adherence to tradition--and opposable thumbs--are what separate us from the beasts, of course. Syria has too few loyal troops to control the entire country of 23 million people. At some point, they are going to need to concentrate on holding the core regions of Syria to maintain the regime even if the price of maintaining the regime is territory. Troops seized eastern suburbs of Damascus from rebels late on Sunday, opposition activists said, after two days of fighting only a few kilometers from the centre of power of President Bashar al-Assad. "The Free Syrian Army has made a tactical withdrawal. Regime forces have re-occupied the suburbs and started making house-to-house arrests," an activist named Kamal said by phone from the eastern al-Ghouta area on the edge of the capital. The Syrian government recaptured the areas pretty quickly, so the FSA isn't terribly strong. But the problem for Damascus isn't in capturing areas. They've been playing whack-a-mole for many months now. 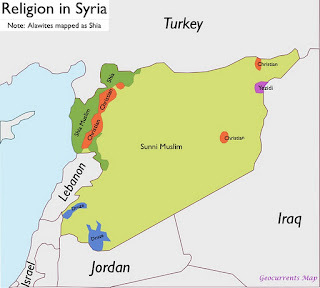 The problem is they have to move on to new areas to whack the rebels and scatter demonstrations against Assad. The regime security forces have to be getting tired (no rotations home for them). At some point, as I said, Assad is going to have to abandon the "clear, move on, re-clear" strategy. That counted on the people getting tired of dying. But with the memories of Mubarak and Khaddafi going, Arab League interest, and a growing trickle of defections from the Syrian armed forces, the people seem to be getting enough encouragement to keep going. "Clear and hold" is the way you separate insurgents from a population whose support is vital for insurgents to survive against their more heavily armed government opponents. 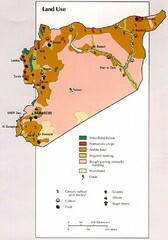 And if the Syrians are to hold ground, they need to choose what ground they are going to hold. 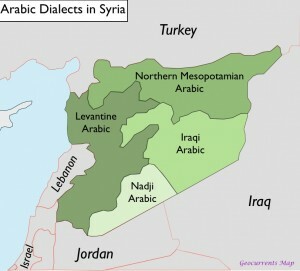 Perhaps the Syrians would need to control the river valleys indicated above for agriculture and for hydro-electric power (?). But that's a lot of troops that have to control that. Plus, Syria's oil resources are in the extreme northeast (although it isn't on that map). I don't know if that oil gets shipped out through Turkey or crosses Syria to the coast. If Assad tries to control the river valleys and oil transport corrdiors all the way back to the core western area, it makes a mockery of the idea of holding a core area. But some assets outside of the core area would have to be held until the core area could organize and send out relief forces to expand government control as resources allow. Outposts at other critical locations outside that zone could become the focus of conflict if the opposition can exploit abandoned zones and turn them into liberated zones. What will Syria's Kurds do out in the far northeast of Syria? Syria would probably need to use air power to hit the abandoned zones to try to keep them from becoming liberated zones that are launching pads for attacks into the core zones. And Russia is willing to sell cheap Yak-130 aircraft useful for such missions and is willing to veto UN Security Council resolutions that might seek to punish Syria for bombing civilians. At that point, Syria would need to consolidate their power in their core zones and then expand ground power to begin expanding their controlled zones. Would Iran send forces to help? If not, Assad will have to call on a lot of sacrifice from his minority supporters to provide recruits to fight the majority Sunnis. Even the well off won't be able to avoid sending their sons into the security forces. Unless the protesters lose the will to resist, it seems that the situation has to evolve into a civil war with each side holding its own territory. Assad doesn't have the horses to hold everywhere against anything but token resistance. If armed resistance continues to grow, Assad is going to have to write off peripheral areas, at least temporarily, to hold what he needs to maintain his regime in power. UPDATE: Oh, Syria isn't going to get Yak-130s any time soon. My point is just that Russia is willing to sell them and that they'd be useful. For Assad, he'll have to win this uprising without them. But surely he's thinking about the next one. Russia's Deputy Defense Minister Anatoly Antonov said his country is not violating any international obligations by selling weapons to Damascus. "As of today there are no restrictions on our delivery of weapons," he told journalists in Russia, according to the country's state news agencies. "We must fulfill our obligations and this is what we are doing." I'll admit that I'm a bit jealous of the reputation Russia must have for sticking with an ally. Well, there's the Khaddafi exception--but in Moscow's defense, we did twist the UN authorization for protecting people into regime change. That's not a mistake Russia will make a second time. From a British perspective, these comments were deeply disappointing, but not altogether surprising, given Obama’s history on the issue. From an Argentine perspective, the comments represented a major diplomatic triumph. More reasons that no British prime minister is again going to gaze on President Obama with a puppy dog look of love. Yeah, President Obama is restoring our reputation abroad, alright--restoring it to Jimmy Carter levels of fear (by our allies of being abandoned) and contempt (by our foes who believe we will always retreat). It isn't so much that the global warming fanatics pretend that their models are actual data about the future many decades or centuries out, but that the global warming fanatics' models didn't predict that world temperatures would stop climbing for the last fifteen years (tip to Instapundit). And to top it off, they won't even admit that global warming has halted. For fifteen years, now! So who's the "denier" side, here? How can the global warmists say the science is settled when the science doesn't show that their claims are coming true? Russia's defiance of international efforts to end Syrian President Bashar Assad's crackdown on protests is rooted in a calculation that it can keep a Mideast presence by propping up its last remaining ally in the region — and has nothing to lose if it fails. The Kremlin has put itself in conflict with the West as it shields Assad's regime from United Nations sanctions and continues to provide it with weapons even as others impose arms embargoes. Wasn't caving in to Moscow by abandoning the Bush missile defense plan for Europe (and America, I should add) supposed to make Russia our "reset" friend after George W. Bush squandered our wonderful opportunities for working together? Maybe if Russia had something to lose--like major efforts to push for NATO expansion into Ukraine and Georgia, or the deployment of a token American Army presence in Poland--Russia would reset their behavior. Are Elections Over in Egypt? The outcome of Egypt's first round of elections is disappointing but not terribly shocking. Islamists are dominant. The key, I believe, is to help design a system where Islamist dominance can be checked by future honest elections. The Egyptian delegation hopes to meet with officials at the State Department and the Pentagon. It will also hold talks on Capitol Hill, where lawmakers will soon consider a new request for aid to Egypt's military, which now runs about $1.3 billion per year, one official said, speaking on condition of anonymity. The Egyptian visit comes after Egypt's military-led authorities pounced on non-governmental organizations, including several funded by the U.S. government, and slapped travel bans on six American staffers including a son of U.S. Transportation Secretary Ray LaHood, a former congressman. The Egyptians are being awfully aggressive toward us. Which may actually be an improvement over the initial anti-Israel statements coming out of Egypt. Now, Egyptians seem to be having second thoughts about tearing up a peace treaty with a country capable and willing of tearing them up. In that light, America is a safer target of a two-minute hate because we aren't likely to react to the bluster. Many countries paint us as the looming threat because in the end it is safe to tweak us to rally domestic support without worrying that we'll live up to their hostile image they've painted of us. But we have a lot to talk about with this delegation. Bluster should stop. And if it doesn't stop, it should at least be no more than bluster. Pharaoh needs to let our people go or the plague of no money or weapons could descend on them. Thirty years after Egypt switched from Soviet to American support, Egypt is still rebuilding their military. Russia won't pay to rearm Egypt if the Egyptians decide to screw us and lose our support. Maybe China would pay. But so far they seem unwilling to pay for Pakistan's allegiance when India looms over Tibet. And Egypt would lose the ability to maintain their American equipment and could look forward to more decades of rebuilding. We can't just bully the Egyptians. Our money and arms don't provide us with the ability to just tell them what to do. Egypt might decide pride is more important than money and arms. They'd be wrong in the long run, but in the short run they'd feel pretty good. And we'd have the problem of losing Egypt and maybe even losing military use of the Suez Canal (from either a closure or as a result of a foolish war with Israel that leads to Israeli tanks sitting on the east bank of the canal) when the Persian Gulf is heating up again. Our goal right now must to be to shield the NGOs in Egypt who are our best hope of building a system of elections that are fair enough to check the extreme ambitions of the Islamists by allowing Egyptian voters to audit the results of the Islamists' first term of office. The Shia Iraqis, who now control the government and security forces, could crush the Sunni Arabs, but the Sunnis do not believe this. It's an article of faith that the Sunni Arabs must prevail. It is God's Will. So the Sunni terrorists continue attacking, and the Shia dominated government threatens harsher punishment against the Sunni Arab community. This retribution is already underway, with the arrest of elected Sunni Arab politicians who are accused of participating in the terror attacks. All Sunni Arab politicians must have some relationships with Sunni Arab terror groups because the Sunni terrorists regularly assassinate Sunni Arab politicians they believe are "disloyal." It's easier (and a lot safer) to maintain some relationship with the terror groups than to openly oppose them. The Shia majority insists, for obvious reasons that the Sunni Arab leadership cooperate in crushing the Sunni Arab terror groups. But the Sunni Arab belief in their own superiority, and eventual regaining control of the government, is too widespread to be easily eliminated completely. As a democracy, the Shia politicians cannot ignore popular demand from the Shia majority for some action to end the Sunni terrorism. If the Shia majority is denied the ability to use rule of law to curb extremist Sunni Arabs who dream of a restoration of their God-given right to rule the Shias and Kurds, the Shia majority will use other--more violent--methods. Their constitution is not a suicide pact. We need to support rule of law in Iraq even if that means that the calm of Iraq is upset with a crisis over lingering Sunni Arab support for terrorism against the Shia majority. Terrorism needs to be completely suppressed. The calm from letting Hashemi go without trial would just be the quiet of a boiling pot's lid being held firmly down and would explode eventually. It isn't success if our policy simply makes the explosion happen sometime in mid-November after our presidential election is over. We need to be creative to break the deadlock and allow a trial. There is no doubt that some of Iraq's Sunni politicians are friendly with terrorists--if only to survive. Hashemi may or may not be guilty of active participation or even just looking away so subordinates can be participants. We need to provide assurances to all parties that the rule of law will fairly judge and punish those accused of terrorism and avoid persecuting the innocent. And rule of law must make progress in destroying the remnant terrorists who still plant bombs and kill. Iraq needs law and order and not just the quiet of a building storm. And let me repeat that several American combat brigades able to side with factions that are attacked would do wonders to give Iraqi factions the confidence that they can rely on rule of law to settle disputes. An official Chinese newspaper says Beijing must punish the Philippines economically for proposing closer military ties with Washington. I think Peking just made our negotiations for basing arrangements a little easier. China feels strong enough to not need to use smiling diplomacy to persuade. But China isn't strong enough to purely bully countries into doing what they want. In that gap we have room to maneuver. Bird enthusiasts are reporting rising numbers of snowy owls from the Arctic winging into the lower 48 states this winter in a mass southern migration that a leading owl researcher called "unbelievable." Since lemmings are 90% of the snowy owl's diet in breeding season, lots of lemmings led to a population boom of snowy owls. That's why they are heading south in unprecedented numbers. That is interesting. So how do we know there is a population boom? He said snowy owl populations are believed to be in an overall decline, possibly because a changing climate has lessened the abundance of vegetation like grasses that lemmings rely on. Oh. We now learn that the snowy owl population is in decline. And this is because the supply of food for lemmings--which snowy owls rely on--has declined. Which must mean there are fewer lemmings. So snowy owls are flocking south because of a population boom but the population is in decline? And the snowy owls had a population boom because they had lots of lemmings to feast on but a "changing climate" has reduced the food supply of lemmings--presumably meaning there are fewer lemmings for the snowy owls to feast on? Huh. How did the reporter become so wise in the ways of science reporting? This winter's snowy owl outbreak, with multiple sightings as far south as Oklahoma, remains largely a mystery of nature. "There's a lot of speculation. As far as hard evidence, we really don't know," Holt said. Ah, they really don't know. But whether there are more or fewer snowy owls or lemmings--or whether someone turned them into newts (before they got better)--we can at least speculate that "changing climate" is at fault. We can at least settle lemming-like on that explanation, right? Now let's get a big grant to settle the question by seeing if we can build a bridge out of snowy owls. French President Nicolas Sarkozy's decision to fast-track its withdrawal — just days after an Afghan soldier gunned down four French troops — is the latest crack in a coalition already strained by economic troubles in Europe and the United States, the Afghan government's sluggish battle against corruption, on-again off-again cooperation from neighboring Pakistan and a dogged Taliban bloodied but not beaten. The French suffer from simplistic thinking about Afghanistan. Their lack of nuance is troubling. Oh, and thank you to France for rejoining the NATO military arm after the Soviet threat to conquer Western Europe collapsed and in time to undermine NATO's will to fight in Afghanistan. But perhaps I'm being unfair to France. Perhaps they need to gather resources to secure Libya in the face of mounting post-Khaddafi tensions. And perhaps I have a date with Summer Glau this coming Friday. Yonathan Melaku was sneaking through Fort Myer and Arlington National Cemetery, his backpack filled with plastic bags of ammonium nitrate, a notebook containing jihadist messages, and a can of black spray paint. The 23-year-old former Marine was heading to the graves of the nation’s most recent heroes, aiming to desecrate the stones with Arabic statements and leave handfuls of explosive material nearby as a message. It was all part of a solitary campaign of “fear and terror,” federal prosecutors said. But authorities and Melaku’s defense attorney said no one knows for sure what led Melaku — a naturalized U.S. citizen from Ethi­o­pia, local high school graduate and former Marine Corps Reservist — down that path or what message he was trying to send. Huh. How on Earth are we supposed to figure out just what would have motivated this man? My God, if only we had clues that might indicate his motivation! Maybe then we could act to combat others like him (or is he just a lone nutjob?). If only we had ways to teach people who write articles how to do it properly? Perhaps we could call them "journalism schools." Ah well, perhaps some things are just not knowable. But until we can figure it out, it would be safest to assume he is motivated by Tea Party hate and urge Tea Partiers to tone down their rhetoric. After all, the Department of Homeland Security has warned us of the violent tendencies of military veterans. Or maybe--if you sympathize with the man--he might clearly be concerned with income inequality and only wants to show his solidarity with the 99 percent. Best enact the Buffet Rule now. Just to be safe. Me? Until proven otherwise, I blame global warming. If Iran closes the Strait of Hormuz in retaliation for Western sanctions that target Iran's oil exports, we will have to fight in the Persian Gulf. But we don't want to put our carriers in the Gulf since that is too close to Iranian shore-based assets. We need the maneuvering room of the Arabian Sea. Officials said the staging base would allow commandos, helicopters, speedboats and even aircraft with a short-takeoff capability to operate in regions where the United States does not have access to installations on land. Each barge would have a mixture of patrol craft, including Vietnam-era riverine patrol boats (PBRs), Navy SEALs, and a Marine platoon. Should the Iranians directly challenge the barges, positions would be reinforced with metal plating and sandbags while the marines manned various weapons: 50 caliber machine-guns, MK–19 grenade launchers, a TOW missile, 81mm mortars, and Stinger missiles. With the addition of an explosive ordnance team and a Marine Corps radio reconnaissance linguistic and communication detachment, Hercules and Wimbrown VII would carry complements of 177 and 132, respectively. Barges would be moved randomly every few days among the Saudi islands and oil platforms and have a layered defense. Helicopters would interdict any target out to 50 nautical miles while MK–III patrol boats covered the mid-distances and smaller Seafoxes and PBRs safeguarded for the first five miles. If all else failed, the Marine security force would man the decks with machine guns, rifles, and side arms. In practice, the patrol boats only operating out to 16 miles rather than 25. The article describes how we fought with those barges as the persistent frontline force backed by traditional naval assets (including aircraft) further back, which should provide a guide to how we would use Ponce in a clash with Iran. “Would you rather risk losing two oil barges or a billion dollar ship?” The threat of mines or an errant missile from an Iraqi aircraft simply made the northern Gulf too risky for a gray hull. Oh, and ponder the fact that we built the Littoral Combat Ship to get in close to shore to fight. But even these ships are too expensive to be considered expendible. Sure, it is better to risk an LCS than an Aegis destroyer or cruiser (or carrier), but they are not appropriate for the Gulf in the early stages of a conflict with Iran. I'd still rather risk losing the converted Ponce than a half billion dollar warship (those mission modules aren't free, remember) that is neither cheap enough or survivable enough for the mission. We have to fight in the Gulf to beat Iran. But we still need options for what we use in the Gulf to fight Iran. This writer says that chaos in Honduras is the fault of America for not backing Zelaya in 2009. This is hogwash. If problems in Honduras are the fault of America, it lies not in the failure to back Zelaya who himself was trying to destroy the Honduran constitution, but in failing to fully back the Hondurans who successfully stopped Zelaya from carrying out a coup to join hands with his Leftist friends in Nicaragua, Cuba, and Venezuela. Given the pedigree of the writer, no doubt she is upset that the Leftists in Honduras were thwarted in their attempted coup. Well, so far President Obama's campaign stop in my city hasn't disrupted my movements. That's good. But I wouldn't have complained if it did. As far as I'm concerned, our presidents are targets and they should have a security bubble around them as they travel. You just don't take chances with our presidents. The only bad thing I want to happen to this president is waking up after the election in November to find he has lost his reelection bid. The lack of warming for more than a decade—indeed, the smaller-than-predicted warming over the 22 years since the U.N.'s Intergovernmental Panel on Climate Change (IPCC) began issuing projections—suggests that computer models have greatly exaggerated how much warming additional CO2 can cause. Faced with this embarrassment, those promoting alarm have shifted their drumbeat from warming to weather extremes, to enable anything unusual that happens in our chaotic climate to be ascribed to CO2. The sky is not falling. And if it does, the solution that the Warmists advocate is wrong anyway. So President Obama is extolling military virtues that he thinks all Americans should show to support his programs? Perhaps now you can fully appreciate this quote. Gosh, I feel so honored that our President is in my home town today. Consider me a conscientious objector to his metaphorical wars. The Washington Post reported on Thursday that negotiations that would lead to a return of U.S. bases to the Philippines were in the early stages. Officials from both governments were quoted as saying they were favorably inclined toward a deal. It seems to me that we are more likely to be trying to get US forces to rotate into the Philippines to keep the bases warm rather than return to a permanent US presence there. Which may be good enough. As long as I seem to be getting what I ask for, hey Summer Glau? Call me. Hey, I'd settle for less than permanent basing, too. The Army would shrink by 80,000 soldiers, from 570,000 today to 490,000 by 2017. That is slightly larger than the Army on 9/11. The Marine Corps would drop from today's 202,000 to 182,000 — also above the level on 9/11. If memory serves me, we had about 470,000 (480,000-my memory did not fully serve me) pre-9/11 and that was insufficient by about 40- or 50,000 to fully man our force structure of 32 combat brigades. I expected we'd lose some troops but hoped to retain something on the order of 520,000 to at least fully staff the pre-war Army (while painfully aware that we are not yet "post-war," although the reductions won't fully take effect until 2017--unless more cuts are heaped on top of this one). The U.S. Army plans to slash the number of combat brigades from 45 to as low as 32 in a broad restructuring of its fighting force aimed at cutting costs and reducing the service by about 80,000 soldiers, according to U.S. officials familiar with the plans. Officials said the sweeping changes will likely increase the size of each combat brigade -- generally by adding another battalion -- in an effort to ensure that those remaining brigades have the fighting capabilities they need when they go to war. A brigade is usually about 3,500 soldiers, but can be as large as 5,000 for the heavily armored units. A battalion is usually between 600 to 800 soldiers. Keep in mind that right now, our brigades have two line battalions with a third small "recon" battalion (a really light targeting and surveillance outfit) instead of the older "triangular formation of three line battalions. So adding a battalion just gets us back to what we had per brigade pre-9/11 rather than representing an advantage over the older brigades. Although the brigades may be bigger if the battalions are retaining their new organization of 4 line companies per battalion (that is, a heavy battalion now has 4 companies--2 armor and 2 mechanized infantry) rather than the older triangular structure of 3 line companies per battalion. Or are we not just shrinking the Army but reorganizing root and branch one more time? Personally, I'd rather have more of the two-battalion brigades than fewer three-battalion brigades. German practice in World War II showed two-battalion regiments worked just fine in conventional warfare. And since we have apparently assumed we won't be fighting insurgents anymore, why do we need beefed up brigades? And if we do need beefed up brigades, we do have the Army National Guard which could contribute battalions to active brigades. I need a lot more details. Hopefully, Strategypage will address the questions that the press won't even think to ask. Spring Comes Early to Tibet? I read about an incident involving China's Tibetans, but didn't note it since it seemed small. A Tibetan-inhabited region of China appeared to be under lockdown Thursday after it was rocked by deadly clashes, as exile groups gave grisly details of how the unrest unfolded. The west of Sichuan province, which has big populations of ethnic Tibetans, many of whom complain of repression, was earlier this week hit by some of the worst unrest since huge protests against Chinese rule in 2008. Security forces fired into two separate crowds of protesters in Luhuo and Seda towns on Monday and Tuesday in the remote prefecture of Ganzi, which borders Tibet. If news is leaking out of this interior location, it must be big. The three clashes, all in the past week, killed several Tibetans and injured dozens. They mark an escalation of a protest movement that for months expressed itself mainly through scattered individual self-immolations. It's the result of growing desperation among Tibetans and a harsh crackdown by security forces that scholars and pro-Tibet activists contend only breeds more rage and despair. Remember that China's leaders consider controlling Tibet a core interest of the state. Check out a map and consider how the Chinese would feel with a pro-India Tibet jutting into China's most populous regions. Then consider what that would do for separatist feelings in the northwest. And then consider whether China would be a major power if it is pushed out of range of influencing Central Asia to become more of a coastal state. Whatever the Chinese do, it won't be letting Tibet go free. In the last decade, the U.S. military has enlisted some 70,000 non-citizens, about five percent of all recruits. These foreigners made better soldiers than American citizens. The foreigners are tossed out during their first three months of service at half the rate of their citizen counterparts. After three years of service, 72 percent of citizens were still in uniform, compared to 84 percent of non-citizen troops. The foreign troops are more patriotic and work harder than their citizen counterparts. Non-citizen troops have another incentive, as they can apply for citizenship because of good service in the military. Any foreign recruit forced out for medical reasons (because of combat or non-combat injuries) can still obtain citizenship more quickly. Most foreign troops obtain citizenship as soon as they can while in the military, because many jobs require a security clearance and only citizens can get one of those. For those who worry that these are foreigners doing a job Americans won't--or that we are creating a civil-military divide--we used to have a much higher percentage of foreigners in our military. As far as I'm concerned, we should have recruiting stations abroad to bring in the Americans-at-heart who live in nuanced nations that don't believe defending Western civilization is any concern of theirs. When our jihadi enemies recruit not from a national pool but from an international pool of recruits who fight us even though their own governments may be our allies, why can't we do the same? Israel screwed the pooch in 2006 when they fought on Hezbollah's terms in Lebanon and engaged in shallow, small-unit frontal attacks on small Hezbollah light infantry units that fought from prepared defenses to shield their missile launching sites. Sure, you can call it a tactical victory because Israel inflicted more casualties on Hezbollah than they endured, but that is no way to measure victory against an enemy that values lives so cheaply. I assume that any war will be a multi-division push north of the Litani that will take advantage of the fact that Hezbollah, after 2006, wrongly believes it can go toe-to-toe with Israeli troops and so will fight as light infantry rather than as insurgents. For a while, Israel will be able to really pound Hizbollah ground forces as the Israelis take over rocket-launch sites and armories with troops. Further, I'd guess the Israelis will push rapidly into the Bekaa Valley as far as Baalbek to tear up Hezbollah's rear area to slow down rearmament after the war is over. Air strikes would take place north of that, if necessary, I'd guess. The Gaza Winter War of 2008-2009 provides a hint of how the Israelis will approach that war. Israel may or may not have stopped in 2009 too early, but their ground forces did very well, in contrast to 2006. Israel recently held its first large scale airborne assault exercise since the 1990s. Over a thousand soldiers of the Paratrooper Brigade jumped. Since the 1990s, only small groups of paratroopers have dropped, and the mass jump is part of an effort to prepare the Paratrooper Brigade to carry out large scale jumps. This is part of a new policy to increase the ground forces ability to fight conventional war. Drop paratroopers in Baalbek to hit and secure the Hezbollah rear area, drop troops by helicopters at key points between Baalbek and the Israeli border to facilitate movement north, and unleash mechanized units to advance around Hezbollah light infantry in the south to link up with the paratroopers (and smash up the isolated Hezbollah infantry left behind), and the next war will be very unlike the airpower-centric failure that 2006 was. Panetta is quoted in a press release on the Defense Department website as saying two of the four BCTs that are permanently stationed in Europe will be replaced with rotational units, similar to the way Marines and Special Forces units staff their European requirements. I'd guess that battalion-sized units will occasionally rotate through Bulgaria and Romania, based on plans that I read about years ago. I'd rather have a full corps retained in Europe (with forward elements providing 5 combat brigades), but that isn't happening. And we no longer have the prepositioned equipment in Europe that we used to have in the Cold War when the plan was to fly in troops rapidly to meet up with equipment stored in Europe to halt a Soviet invasion. Let me note that "APS-1" is the entire continental United States (CONUS) and has no unit sets. Interesting that Afghanistan has a battalion set so we could fly in a battalion if we really needed some reinforcements fast. I'd feel better about our reductions in Europe if we at least replaced the two departing brigades with prepositioned equipment for a couple heavy brigades and put them in southern Poland. I hope we never need them, but that is what insurance is for, right? I didn't listen to President Obama's State of the Union address. It would have just raised my blood pressure. Here are several reasons why (tip to Instapundit). The President has nothing to say to me. I don't trust him or anything he says. UPDATE: Also via Instapundit, his cabinet has nothing to say to me (OK, maybe Panetta does). Face it, the economy wasn't worse than the administration thought, as they like to explain it away now--their response was worse than they admitted. To us, anyway. At the time, I figured the spending spree from the liberal wish list was wrong but the White House perhaps believed the stimulus would work. Is it better or worse that they knew what they were doing was counter-productive or ineffective? This should have been a serious speech addressing the economic problems facing the United States. Instead it was a laundry list of half-baked proposals designed to appease the Left. The president should have been talking about reining in spending, lowering taxes, and fostering greater economic freedom, but he opted for policies that will speed America’s decline, not reverse it. OK, I'm done with this. I can feel my blood pressure rising just listening to sound bites on the morning news. It's time to go back to talking about despots and terrorists who I expect to want to harm America. Military helicopters ferried elite troops to the pirate camp in scrubland close to Haradheere, a major pirate base in central Somalia, Washington's Germany-based Africa Command (AFRICOM) said in a statement. "All nine captors were killed during the assault," it said. It's a good thing to rescue hostages. But raids like this and defensive successes at sea are just the cost of doing business to the pirate bosses. Obviously, the people rescued think it is the best thing in the world, but until somebody goes into Somalia to kill a lot more than nine pirates and control the ground where the pirates are based, the piracy will continue. For the Spanish government, the calculation is simple. Spain is full of restive regions that want to go their own way: Catalonia and the Basque country in particular have strong independence movements. One argument that separatists in European countries use is that because the newly independent countries could join the EU, independence is a low cost, low risk step. Consider this incentive to divide a feature of the European Union rather than a bug. The Brussels transnational elites will laugh all the way to their new undemocratic empire while the silly people atomize their once-influential nation-states into little ethnic theme parks. Let the people have their postage stamps and flags, the EU overlords likely think! The power will lie in Brussels, and who will be large enough to stop them? It will be interesting to see if the EU allows a mere nation like Spain to stop small pieces of Europe from joining the new European empire that the Brussels transnational elites are building. As the subject of a film, the scope of the problem may be grossly exaggerated. Few film makers are military-friendly. But if there is a problem with rapes in the military, we owe it to every female member of the military (and some male, apparently) who enlists to defend our nation to make sure that the threats to their lives and well being only come from enemies and not those who wear the same uniform. Remember, the military is an honorable institution. But honor requires the dishonorable members to be removed rather than ignoring them out of fear that the whole institution will be branded dishonorable because of their actions. In the end, the failure of honorable leaders to punish the dishonorable is what brands an institution as lacking honor rather than the dishonorable themselves (because every institution has dishonorable members). Deputies in Egypt's first post-revolution parliament on Monday elected Saad al-Katatni, a leading member of the powerful Muslim Brotherhood, as speaker. Katatni won 399 votes out of 496 in the first session of the lower house of parliament since it was dissolved following a popular uprising that ousted veteran president Hosni Mubarak. The Islamists had the street cred from long opposition to the Mubarak regime. And they were organized. It isn't shocking that they won. But it isn't a reason to deny Egyptians democracy. What we need is not to engineer particular victors but to engineer rule of law that makes sure there are more free elections. The Arab Spring is a long-term project. It isn't a reality show that wraps up after 26 episodes. Katatni is saying good things about democracy. Let's work to make sure those words come true. If we can do that, over time the Islamists will have to submit to voter audit of their policies and the people will have a chance to decide if the Islamists are truly deserving of power. In a free society, people are free to make mistakes. If the mistake doesn't end democracy, a free society provides the tools to fix the mistake. So in the heat of battle, against an enemy that did not wear uniforms and hid amongst civilians to use them as cover, a squad of Marines killed some civilians by mistake. I was initially willing to believe that something bad might have happened, even as I was outraged that anti-war people used the allegations of one incident to tar all of our fighting men and women as killers or potential killers. But there was no war crime by our Marines--just an accident that happens in war. So the actions of those Marines made in a heart beat have been scrutinized for six years by people not being shot at. This is a problem, as I've written. Funny thing about war. War happens and even innocent people die. Or have their reputations soiled for a mistake that while it had tragic results, was no crime. We could go a long way to undoing the damage done by the anti-war side to the honor of our military by renaming one of our ships that honors a Congressman all too painfully eager to believe that Haditha was a war crime. The Year of the Dragon is beginning and many people think China is breathing fire down our neck as they prepare to pass us by. Let's face it, there's a general anxiety about the future of America. There's Tom Friedman's column today, which my doctors have now forbade me from critiquing in order to keep my blood pressure down. Thanks for the warning. I'll tend to my health and avert my eyes from even a glance at whatever drivel Friedman has come up with. So, America is doomed, right? To be honest, this sounds like a lot of pious baloney. As Michael Beckley points out in a new article in International Security, "The United States is not in decline; in fact, it is now wealthier, more innovative, and more militarily powerful compared to China than it was in 1991." Huh. Not doomed. I keep writing that. And recently warned about believing we are doomed so we are relieved of the responsibility of working hard to defend our lead. The first step toward sound strategy is to recognize that the status quo for the United States is pretty good: it does not face a hegemonic rival, and the trends favor continued U.S. dominance. The overarching goal of American foreign policy should be to preserve this state of affairs. Declinists claim the United States should “adopt a neomercantilist international economic policy” and “disengage from current alliance commitments in East Asia and Europe.”161 But the fact that the United States rose relative to China while propping up the world economy and maintaining a hegemonic presence abroad casts doubt on the wisdom of such calls for radical policy change. One can argue that it is unfair to compare defense budgets because America’s military resources are dispersed across the globe while China’s are concentrated in Asia. China, however, does not devote all, and perhaps not even a majority, of its military resources to contingencies involving the United States. China shares sea or land borders with nineteen countries, ªve of which fought wars against China within the last century; its northern and western borders are porous and populated by disaffected minority groups; and its government faces a constant threat of domestic rebellion. As a result, the People’s Liberation Army (PLA) devotes substantial resources to internal security and requires 300,000 troops just to police China’s borders. Yes, there is that aspect. Beckley's measure of military power ignores nuclear weapons, which I think is right for this level of analysis. So we aren't declining relative to China and aren't doomed to second place. As Beckley wrote, perhaps there is some advantage to believing we are doomed as long as enough people react by trying harder rather than giving up. So far, in the face of other prophets of doom, we've dispatched our supposed rivals whose threats to pass us by and bury us were said to be imminent. As long as we regain a correct view of the actual balance before we or China do something stupid in the false belief that China is about to become the dominant power on the planet, it will be a helpful delusion. But the idea that we are doomed is a delusion. Don't be so quick to write America off just because a number of smart people (they say so themselves!) think we are doomed. The point of tough sanctions, of course, is to force Iranians to the bargaining table, where we can do a deal that removes the specter of a nuclear-armed Iran. (You can find some thoughts on what such a deal might entail on my blog.) But the mistrust is so deep, and the election-year pressure to act with manly resolve is so intense, that it’s hard to imagine the administration would feel free to accept an overture from Tehran. Anything short of a humiliating, unilateral Iranian climb-down would be portrayed by the armchair warriors as an Obama surrender. Likewise, if Israel does decide to strike out on its own, Bibi Netanyahu knows that candidate Obama will feel immense pressure to go along. That short-term paradox comes wrapped up in a long-term paradox: an attack on Iran is almost certain to unify the Iranian people around the mullahs and provoke the supreme leader to redouble Iran’s nuclear pursuits, only deeper underground this time, and without international inspectors around. Over at the Pentagon, you sometimes hear it put this way: Bombing Iran is the best way to guarantee exactly what we are trying to prevent. Tough sanctions years ago might have had a chance to stop Iran. But the lesson of Iraq is that tough sanctions--or even mild sanctions--can be portrayed as starving little children even as the regime finds money for what it wants. Keller can talk about how he'd negotiate a deal, but this armchair diplomat is negotiating with himself--not actual Iranians who have been amazingly diligent in pursuing nuclear weapons despite world opposition to their plans. Good God, man, if the Iranians believe they need nukes to deter an invasion that we've apparently been perfecting for three decades now, they might actually believe we'd lie to them in order to trick the Iranians into giving up their nuclear weapons program. Hmm? And Keller's description of getting anything less than denuclearization of Iran as something that can be portrayed by President Obama's foes as a surrender rather than being an actual foreign policy defeat is mind boggling. Yes, Mr. Keller, anything short of Iran giving up nuclear weapons plans would be a defeat for us. And any President who lets Iran go nuclear should properly be condemned for putting America's safety at risk. The idea that attacking Iran will unify the people of Iran--who mostly hate the regime--is an article of faith in some circles. But while there will surely be some "rally around the flag" effect, when that wears off Iranians will ask why they have a government that provokes attack--or at least can't protect them despite all the claims about super weapons that Iran has been building for decades now. Or did I miss the resolute support that liberals enthusiastically provided George W. Bush for 7 years after the 9/11 attacks to bolster his efforts to protect us? Further, I'll ask this question again: what good does it do us to have a nuclear-armed Iran with rulers who hate us but with people who don't like the regime? Would poor poll ratings deter the mullahs from using a nuke? Would we really feel comforted if the people of Iran mostly felt really, really bad if their rulers used a nuke on Charleston? And Keller's protest that Iran will continue their efforts if we attack is pointless. Unless that magical diplomacy works, Iran will get nukes eventually if we don't attack. If we knock them down far enough, redoubling their efforts will still mean they won't reach their nuclear destination as fast as they would have without our attack. And so what if our attack forces Iran deeper underground? If we refuse to attack, it could all be on the surface for all that matters. If Iran digs deeper, that at least takes more time and effort--which slows them down. Further, what's with the wringing of hands over whether international inspectors are in Iran or not? With those inspectors, Iran is advancing toward nuclear weapons! Is Keller so confused that he forgets that the purpose of international inspectors is to prevent Iran from getting nuclear weapons? Does he think that the purpose of having international inspectors in Iran is to have international inspectors in Iran? And I don't care if "sometimes" you hear in the Pentagon the line of thinking that bombing Iran will make them go nuclear. Sometimes Pentagon officials can be wrong or liberal. Bombing Iran won't solve the problem of Iran wanting nuclear weapons. What it does is buy time. In the end, we need a regime change in Tehran. Get a non-mullah regime in Iran and they might decide it isn't worth the effort to build nuclear weapons. And at worst, having a non-nutball regime with nukes is far better than having a nutball regime with nukes. Good grief. Iran is trying to build nuclear weapons right now. Bombing Iran will slow Iran down by an uncertain amount, it is true. But the fact that Iran will likely resume work on nuclear weapons doesn't mean that we caused that attempt to go nuclear. Is Maureen Dowd off today, or something? You want a paradox? How do you write an op-ed without a functioning brain stem? How's that for a paradox? I bet you might even hear that question around the Pentagon sometimes. UPDATE: Iran wants nukes and only wants to talk to mask their progress to getting nukes. But that's too simple for the smart guys with the big desks to accept. Human Rights Watch could very well be stretching the facts to reach their conclusion. But events are cause for some concern. For years, I've said that promoting rule of law would be our hardest task after defeating the terrorists and insurgents. I've wanted our continued military presence to help foster rule of law and entrench it. Without presidential interest and without our military on the ground, it is likely that Iraq's democracy will have difficulty holding its own. I won't say that Iraq is doomed to become a police state (although it is unlikely to be anywhere near as bad as Saddam's police state), but democracy and rule of law could definitely take a hit. But this should make liberals happy, shouldn't it? I mean, that's why the Obama administration is running from Iraq, right? If they won't allow a pipeline from Canada to ship hated oil to us in order to make radical environmentalist campaign donors happy, surely they will refuse to defend the hated Iraq War's victory to keep radical anti-war campaign donors happy. Besides, how can they complain about an authoritarian Iraq? They kept saying we should make a deal with Saddam Hussein rather than fight him. Who, the anti-war people asked, was Saddam going to sell his oil to if not us? Remember how they kept going on about foreign policy "realism?" And truth be told, even an authoritarian Iraq that is friendly to America is an improvement over Saddam's Iraq which was our enemy. But if that is all we wanted to settle for, we could have pulled out our troops many thousands of casualties ago and simply given the Shia majority a green light to kill and torture their way to victory over the Sunni Arab resistance (and screw the Kurds, too). Our troops fought and died to give Iraqis a chance at real freedom, and to set an example for the entire Arab and Moslem worlds that they have another choice besides Islamism and authoritarianism to govern their lives. But we decided to risk all that to have a bullet point on the President Obama reelection web site that says we "responsibly ended" the Iraq War. If Iraqis succeed in building democracy despite our apparent lack of interest in helping them, I hope liberals won't be too disappointed. Violence and political instability have escalated across Iraq since the withdrawal of American forces, as political and sectarian factions have fought for power and influence in a struggle that, within weeks, has threatened to undo the stability that allowed the pullout in the first place. This is why so many people--including me--wanted our troops to stay in Iraq. It is too soon for the Iraqis to run a democracy without a safety net. Too many Iraqis fear the old rules can come back and could be too nervous about that prospect to play by the new rules of democracy and rule of law. Our troops provided an assurance to all Iraqi factions that nobody would be allowed to break the rules (how far you could bend them was the main tactic) to win. Get the Iraqis to agree to a return of our ground troops! Come on, President Obama! Bust a gut to lead on this. What are we paying you for, anyway? Protesters stormed the Benghazi headquarters of Libya's ruling National Transitional Council (NTC) Saturday while its chairman was still in the building. People in Benghazi, birthplace of the revolt which forced out former Libyan leader Muammar Gaddafi, have been protesting for weeks to demand the sacking of Gaddafi-era officials and more transparency about how the NTC is spending Libyan assets. The attack is a serious blow to the self-appointed but internationally recognized NTC, and underscores growing discontent over the way it is running the country. Remember how so many people said that purging Iraq of Baathists contributed to Iraq's civil unrest? I thought that was BS, personally, since you could hardly expect the millions of Iraq victims of the Baathists to just accept the continued dominance of the Baathists--but just as well paid technocrats. You can debate what extent de-Baathification should have been. But not the general idea. And now Libyans, who were blessed by leaders who understood how counter-productive it is to purge the government of former exploiters and prison wardens, are strangely upset that after struggling to free themselves from the exploiters and wardens that the exploiters and wardens seem to still have an important role in the new exploiter- and warden-free Libya. And without government transparency, who knows what those "ex" Khaddafi loyalists might be up to. Silly Libyans. Just because they "won" the civil war they expect their enemy to have "lost?" They really need to fully digest that nuance thing. Supporters of ousted Libyan leader Muammar Gaddafi seized control of the town of Bani Walid on Monday after clashes with a militia loyal to the new government in which four people were killed, witnesses told Reuters. A resident of Bani Walid, about 200 km (120 miles) south-east of Tripoli, said the sides fought using heavy weaponry, including 106 mm anti-tank weapons, and that 20 people were wounded. Not to worry, the Libyan air force is preparing to cope. Or is that no-fly zone to protect the Libyan people from (the new) government's air power still in force? Just wondering. Libya said on Monday that Saif al-Islam Gaddafi would face trial at home, threatening a showdown with the International Criminal Court which may decide to prosecute the son of Libya's former dictator in The Hague. I'm beginning to think that Arabic lacks the word for nuance. Doesn't the new Libyan government know that blood-stained henchmen everywhere respect the rulings of the ICC and simply hang their heads in shame rather than fight when the ICC says they've been bad boys? A planned European oil embargo and other efforts to halt Iran's nuclear program, including new U.S. sanctions, are "economic war," a top Iranian official said. So the West must buy their oil? Or else? Yep, just like Obamacare. And there is no question that Iran has death panels. The issue of Marines urinating on Taliban corpses is a real problem. Not because it shows American troops are awful. You really want to compare peeing on a corpse to beheading live prisoners? At our worst, our guys fight darned clean. The Marines should be punished but nothing that wrecks careers. But it isn't just about those particular Marines. One, if this is a sign of lack of unit discipline, the incident must be addressed and looked at from the point of view of how those troops are being led (or not led, as the case may be). We really don't want to give the enemy propaganda material. This really is a readily digested outrage amidst the carnage of war. What the Marines did wasn't that bad, in isolation, but we can't allow things like this to go on lest it help enemy recruiting. If the problem is leadership shortcomings, consider ourselves lucky this was just a corpse wetting and not something worse. Deal with it now. To be clear, this incident won't cause Afghans to become jihadis and commit terrorism. They did that just fine all on their own before ever seeing an American Marine or soldier. But it does provide a convenient excuse to kill Americans in a barbaric manner. Even better from the enemy point of view, it lets gullible Americans argue that the incident "causes" jihadi anger. We should at least make our jihadi enemies work hard to come up with their flimsy excuse-of-the-moment for why they are vicious terrorists who want to murder us in our homes. Two, it highlights the potential problem of all that battlefield surveillance video out there. War is awful and if you film it, you'll naturally be horrified at what is done even when all the rules are followed. The Greatest Generation's reputation wouldn't have survived the same level of visual recording. We can't allow our surveillance video to be combed for out-of-context images of apparent outrages or crimes. "Our leaders overlooked this degrading and inhumane act of American soldiers because they are interested in peace talks," said Mullah Mohammad Gul, a local Taliban commander in southern Helmand province, where the video is believed to have been made. "Our duty is to defend our sacred religion and our people and we will keep fighting, no matter what." Insurgent fighters in other parts of the country said the video could undermine discipline and push foot soldiers to ignore orders from higher ranked fighters. The Taliban leaders understand that they are getting their butts kicked. At ground level, that reality isn't as obvious for many of the Taliban in the field. So the leaders have a choice of negotiating to get better conditions for success (and calling off the drones that make Taliban rear areas as dangerous for leaders as the front is for the cannon fodder)--but risk losing control of their men; or, in order to keep their men with them, let the war continue at our discretion, which means we continue to make progress on the ground despite the willingness of many Taliban to fight us and continue to target the leaders with all of our forces. So often, our enemies seem to like to talk just to weaken our will to fight. This could be an opportunity for talks with no objective other than having the enemy frontline gunmen see their leaders chatting it up with smiling NATO negotiators. We have a perception problem in addition to our very real problems that we must face economically, diplomatically, culturally, and militarily. While I have no doubt that the Obama administration is doing its best to undermine our national security (even if they surely believe they are saving us), I would never argue that the Obama administration is setting us on a course of permanent decline. We've overcome worst problems. We just don't recognize that. But there is another perception problem, too, that Robert Kagan addresses. Most basically, economically we have not lost ground. Kagan points out something I've repeatedly addressed: that our immediate post-World War II economic dominance was an anomaly based on being the only major economic power not ravaged by years of brutal war and destruction. Of course that dominance could not last as the rest of the world rebuilt. By the 1970s, we could see the results of the rest of the world rebuilding while we coasted on our artificial lead. But we reacted and rebounded. Our share of global GDP has remained remarkably constant at about 25% for many decades now. Europe is surely declining relative to the rest of the world (and masking that decline by adding new nations to the EU so that the decline of the original core is not evident) while Asia gains ground. But we haven't collapsed. Every day seems to bring more proof, as things happen in the world that seem both contrary to American interests and beyond American control. Clearly, our President has this perception problem. The fact that we did succeed (well enough, anyway) to arrive at where we are obscures the failures and even the difficulties of getting the success we did have. Obviously, had we failed enough to screw things up, we wouldn't have the opportunity to discuss why our Golden Age is gone. Just because we don't remember how tough we had it doesn't mean we didn't have it tough. We're not off the hook for facing our problems and solving them. Failing to see the enemy's problems allows us to take the easy way out and assume we must be doomed--so why try to succeed? And failing to see the problems of the past is just as numbing, allowing us to assume that somehow we had more capacity to solve problems--and indeed faced fewer problems than today. So why try to solve problems when they are so much greater now and when our capacity to solve them is so much weaker? Neither perception is true. We are a great power with many assets. Our problems are not beyond our ability to solve--or at least address well enough to give future generations the luxury of believing that this is a Golden Age when the world did what we wanted and no problem was beyond our genius to fix. Work the problems, people. We may want the apparent security of curling up in a fetal position and giving up, but that isn't the way forward. It never has been. I've never felt more strongly that America's best days and democracy's best days lie ahead. We're a powerful force for good. With faith and courage, we can perform great deeds and take freedom's next step… Let us be sure that those who come after will say of us in our time, that in our time we did everything that could be done. We finished the race; we kept them free; we kept the faith. We will have better days. Keep the faith. We just need leaders who will do everything they can to justify my faith in America. France's threat Friday to withdraw early from Afghanistan after an Afghan soldier killed four French troops and wounded 15 is a setback for the U.S.-led coalition's efforts to build a national army and allow foreign troops to go home. The deadly shooting — the second against French forces in a month — is the latest in a rising number of disturbing attacks in which Afghan security forces or infiltrators have turned their guns on coalition forces. "The French army is not in Afghanistan so that Afghan soldiers can shoot at them," Sarkozy said in Paris. "From now on, all the operations of training and combat help by the French army are suspended." If security for the French troops is not restored, "the question of an early withdrawal of the French army would arise," he said. Not very nuanced, if you ask me. Afghanistan is a violent place. It's like going in to build security forces in Los Angeles and you are recruiting gang members. Violence is their way of life, and if they perceive insult, they resort to violence--with the weapons you provided and trained them to use. If there is any arrogance on display by the Frenchmen in dealing with the Afghans, watch out. Violence-prone armed Afghans is the main source of these incidents and not Taliban infiltration. That's the price of doing business there. The French army isn't in Afghanistan to fight. We knew that. (Few Europeans are there to fight.) And now we know they aren't there to face the same occasional dangers that anyone else training Afghans must face. So they'll run if the local reality isn't suspended for them. NATO troops are there in order to create a good security situation. Sarkozy turns the mission on its head and says the security situation is the condition to keep French troops there. The Afghan Taliban said on Saturday they had recruited an Afghan soldier who shot dead four French soldiers a day earlier, raising fears the militant group had managed to deepen its infiltration of the country's struggling security forces. Still, I won't taunt the French too much. The French military is decent if underfunded--and sent into action by insufferable louts. So the conditions of their service isn't up to the troops who will fight if allowed to. Besides, our own president--hardly French even if he aspires to European levels of sophistication--is also eager to answer the question of an early withdrawal of the American army. Ten years ago in response to 9/11, the French declared that we were all Americans, now, united in outrage over the terrorism attacks that day on American targets. Today, we are all Frenchmen, now, in our determination to find excuses to leave Afghanistan before the mission is accomplished. The French are ignoring the fact that Afghanistan is a very violent place and always has been. When someone gets angry and has a weapon handy, there will often be blood. The French government could consult their own medical aid teams, which treat Afghan civilians, and discover the extent of casualties among civilians. When it comes to the law and order Westerners take for granted back home, Afghanistan is a different world. Simplisme is rampant these days. Once upon a time, the European attitude was that it was better to take occasional civilian dead in your streets rather than fight back against terrorists. Now they can't accept occaional military dead overseas as the price of defeating the terrorists. I guess we know how Sarkkozy would run a cruise ship if it runs aground. Pakistan expects to re-open supply routes to NATO forces in Afghanistan, halted after a NATO cross-border air attack killed 24 Pakistani soldiers in November, but will impose tariffs, a senior security official told Reuters Thursday. But the supply lines won't last long as we shift to northern routes to avoid having Pakistan with their hands on the spigot (that we will be giving the spigot to Russia is another worry altogether, of course). So Pakistan will charge more money. What the heck, right? If they are losing the business anyway, why not get some money while they can, seems to be the thinking. Money will be a problem for Pakistan. They soon won't have the ability to extort money for allowing supplies through--whether the extortion is official aid, tariffs, or the bribes needed to let the convoys go through safely. We shall see if the Pakistanis will alter their behavior toward the Taliban (in Afghanistan and in Pakistan) to more consistently help our war effort to keep the money flowing. If they don't alter their behavior, we shall see how they seek alternate sources of money.